There's further upside for Treasury yields and further downside for gold, some analysts say. The Federal Reserve's ongoing effort to prevent the U.S. economy from overheating threatens to squash any rally aspirations among gold bugs, at least for the time being. In September, the Fed hiked its benchmark funds rate to a target range of 2 percent to 2.25 percent, the third such increase in 2018 and the eighth since the central bank commenced its current policy "tightening" cycle in late 2015. Many analysts expect another Fed rate hike in December. COMEX gold futures are already down about 12 percent from a 20-month high of $1,369.40 an ounce reached in April, based on the closest-to-expiration contract. In mid-August, gold fell to $1,167, the lowest level since January 2017. Meanwhile, U.S. benchmark rates keep marching higher, with the yield on the 10-year Treasury note touching 3.24 percent in early October, a 7 ½-year high. Some analysts see further downside for the gold market, as the outlook for even higher interest rates, and higher "real" yields (adjusted for inflation) dampens the metal's appeal for investors. 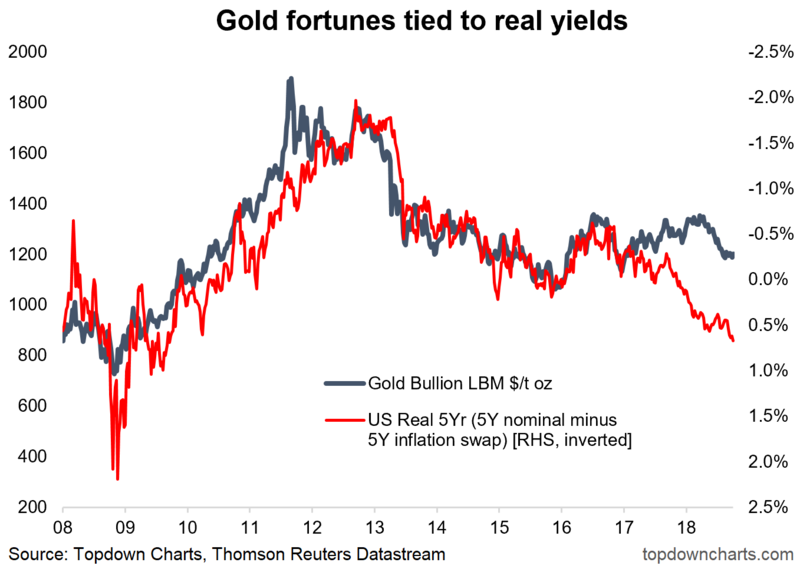 "Real yields are really key in setting directional bias for gold," said Callum Thomas, Head of Research, Topdown Charts Limited. "Taken together, the trend of rising real yields and tightening Fed policy are likely to continue to exert headwinds on the gold price for at least the next six to 18 months. Our charts point to gold falling to at least $1,000, if not lower." Traders and other market professionals for decades have tracked the gold market's performance against benchmark interest rates. Many consider gold a safe-haven -- gold is always going to be worth something, so it's a good place to park money during broader market turmoil, in other words. Periods of high inflation, such as the late 1970s, have also been bullish for gold, as some consider the metal to be the ultimate "store of value." Historically, the distinction between nominal and real, inflation-adjusted rates is critical, as is the "opportunity cost" calculus of gold-versus-fixed-income assets, says David Andolfatto, an economist at the Federal Reserve Bank of St. Louis. "If the nominal interest rate is high because inflation is high, as in the 1970s, that leaves the real rate of interest low. This was a good time to own gold because the real return on bonds was low," Andolfatto says. "The converse was true in the 1980s -- real interest rates were high and the opportunity cost of holding gold was high." Unlike a bond or a share of stock, for example, gold "does not produce any income," Thomas says, "and, indeed, there is often a cost to hold gold -- for security and storage, among other expenses." If rates are rising, even holding plain old cash could generate better returns for investors, compared with gold. Additionally, tighter Fed policy -- higher rates and less liquidity -- often strengthens the U.S. dollar, which can also weigh on gold prices. "Higher interest rates make it less attractive to own gold versus cash, all else being equal." In one measure of the gold-versus-rates performance, Thomas noted a "large bearish divergence" between London-traded bullion prices and real U.S. 5-year rates. As gold prices fell and rates rose, the gap between the two recently reached its widest point since late 2017. The long-term view "suggests we could see further upside in real yields yet, and hence further downside for gold," Thomas says. Still, economic cycles and Fed tightening cycles both eventually run their course. At some point, the Fed will stop raising rates. There's also the risk the central bank goes too far this time. Wrote Norland, "If the Fed overtightens, it could prove extremely bullish for gold when the central bank is forced to reverse course and ease policy."